Our range of Bulletproof Helmets are manufactured for all law enforcing agencies and defense personnel. 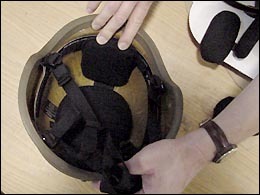 The shell is configured with multiple layers of Aramid (Kevelar or Twaron) composite material throughout any cross-sectional area of the helmet. 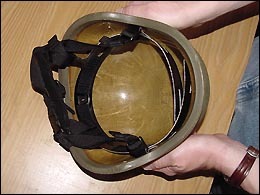 It includes an adjustable headband and a comfortable chin strap assembly. This helmet meats the requirement of the current U.S. military issue Personnel Armor System for Ground Troops (PASGT) ballistic helmet. It has a two, three and four point suspension system and is offset from the head to provide space for deformation caused by projectiles and to allow for increased ventilation. This helmet is rated protection level IIIA in accordance with the National Institute of Justice standards. PASGT, Para Troopers & Combat Designs. Small, Medium and Large size in tailored colors and textures. Light Weight 1.2  1.3 Kgs approximately (3.2 Lbs.). Protection against 9mm Parabellum & Splinters of Grenades. Selectable, Adjustable & Comfortable Suspension Harness. Snap Fit & Quick release Chin Strap. Designed with a low center of gravity with a configuration that extends protection to the areas surrounding neck and ears. Even Offset suspension for Balanced Distribution of Impact. Provision for visor attachment and communication gadgets. Trimming & Drilling with High Speed 5-Axis CNC Routers. Manufacturing on best Engineering CNC Moulds for uniform compression of Panels, flat as well as curved profiles. Tailored shapes and protection possible with In-House CAD-CAM Mould manufacturing. Designed for Law Enforcment Agencies. Protection against .38 pistol from 5mtr. Selectable, Adjustable & Comfortable Harness.